The Talmadge Memorial Bridge was completed in November, 1990 at a cost of $70.9 million. It is described as a “cable-stayed bridge”, which replaced the previous cantilever truss bridge which was built in 1953. The old bridge was simply inadequate for the taller ships entering the port. In fact, two collisions with the pier supports in the river gave urgency to the new project. The bridge provides 185 ft. of vertical navigational clearance at Mean High Water. 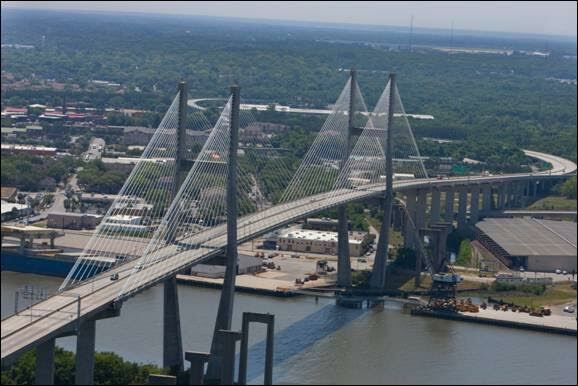 With a main span of 1100 ft. and a total length of 1.9 miles the new Talmadge Memorial carries the 4 lanes of traffic on Hwy 17 over the Savannah River. Prior to the construction of the new bridge, a law mandated that Hwy 17 be re-routed across the Houlihan Bridge. The bridge was dedicated to Eugene Talmadge who served as a Democratic Governor of Georgia from 1933-37 and 1941-43. He was elected to another term in 1946, but died before he could take office. The story is often told that city officials were divided over keeping the Talmadge name for the new bridge, so the mayor simply erected a sign naming the bridge during the cover of night, and the matter was settled. You may notice some of the remaining supports from the old bridge on either side of the river. The cost of removing the old bridge was greater than the cost of erecting the new bridge. Remnants of the old Ogeechee-Savannah Canal can be seen on the Georgia side, under the bridge. This project took many years to complete in the 1800’s, but was only in use for short period of time. During that time, barges were polled or pulled to various plantations along the canal.